Four Ireland players have been shortlisted for the Six Nations Player of the Tournament following Ireland's Grand Slam success. 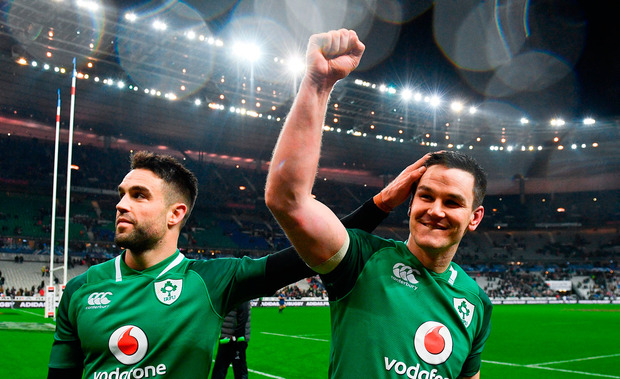 Fly-half Jonathan Sexton and scrum-half Conor Murray were instrumental in Ireland's clean sweep, as were both wingers, 21-year-old revelation Jacob Stockdale – scoring a record-breaking seven tries – and Keith Earls, in the form of his life at the age of 30. Young full-back Matteo Minozzi impressed for Italy, becoming the first Italian player in the history of the NatWest 6 Nations to score a try in four successive games, while France's Guilhem Guirado defensive game was arguably the strongest of his career. For the first time, this year's Player of the Championship shortlist was selected by a media panel of well-respected rugby writers and broadcasters from each of the six nations. The panel each provided their top three nominations for the award following the conclusion of round five. All votes were compiled and added together to identify the six-man shortlist. The shortlist is now open for public voting on NatWest 6 Nations digital channels so that rugby fans around the world can choose the player they believe should pick up the accolade as the 2018 NatWest Player of the Championship.